I really have to say this; it is a genuine honour for METAL TEMPLE to receive promo copies from a new band, especially if that is a debut release. The fact that a band trusts our editors team, literally makes us swell with pride and we definitely want to keep doing this. So, this is exactly the case with GHOST that hails from Norway. Going through the band's biography, I learned that these Norwegians participated in the 'battle of the bands' contest and did not win. Consequently, I did not have high expectations from their debut album entitled "The Engraving". I mean, if the Norwegian fans did not like them, how could I? And then, the self-titled song kicked which made me think "what the hell? "; This band has such a solid sound that can blow your mind off right from the very start. The rhythm is groovy and totally addictive featuring Hard Rock influences (the trademark 4/4 tempo is all around) while the harsh vocals give the band the original identity many new acts are still searching for. The chorus is catchy as hell and the production is totally awesome (remember we are talking about a self release). The 80s references define GHOST's sound bringing to minds bands like DOKKEN or HOUSE OF LORDS, while Kim Sandvik's timbre reminded me of Steve Grimmett in a lower pitch. All these reference may sounds 'too much' or maybe 'over-used' by many other newcomers; but in the case of GHOST, these are embedded in their own sound and hence, are used in this review only for description purposes. The songs feature a mood-lifting groove with very good vocal harmonies and distinct guitar riffs with foot-taping melodies without loosing points in terms of heaviness. 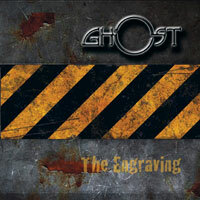 GHOST also succeed in making a stop at the AOR scene, hitting the listener hard with the addictive (yet again) "Alive", the sing along chorus and the killer backing 80s vocals. More Hard Rock is on the way with "One Last Favour" (who could resist the riff driven rhythm) and "Here I Am" where the opening riff bears an almost "Kickstart My Heart" character. This review may sound exaggerated but that is the way I felt listening to "The Engraving". GHOST managed to get my attention immediately and taking into consideration that this is a new band's doing, you will eventually agree with me. Great work and hopefully this will not be just a 'shooting star' and GHOST will continue with the same momentum and a decent record deal.